07/01 - We OPEN for the Season in July!!! Anderson Orchard is one of a handful of orchards in Indiana that offers the unique experience of picking your own produce! 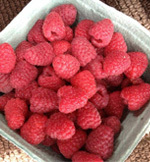 Red Raspberries, Blue Plums, Pumpkins, Apples, and Chestnuts are available throughout the season. 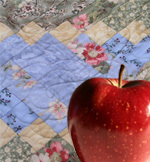 Visit our Apple Varieties page for availability of your favorite apples. For up-to-date availability information for all of our produce, visit our News page. In addition to U-Pick produce, we also offer a wide-variety of fresh fruits and vegetables for sale at our Apple Barn. 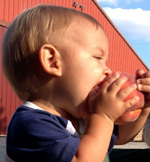 Every week, hand-picked apples from our orchard and fresh, Indiana-grown produce is available in our Apple Barn. Fresh produce is available from July through November. For a complete list of produce, visit our Fruits & Vegetables page. For produce availability dates, visit our News page. Anderson orchard has nearly 30 varieties of apples that you can pick yourself or buy in our Apple Barn! 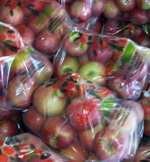 Our apples are available from early to mid July through mid November. For a complete listing of apples available at the orchard, including availability dates, storage, flavor, and cooking information, visit our Apple Varieties page. You're bound to find an apple that's perfect for you! Anderson Orchard is more than just apples. We also sell fresh fruits, vegetables, and other products. Come visit our Apple Barn. We offer a great selection of locally-grown produce and apples straight from our orchard! Our store also offers a wide assortment of Dillman Farms preserves and butters, Coloma frozen fruits and vegetables, squash, fall décor, and gift items. After your visit to our orchard and picking your own apples, stop by our Concession Stand for some refreshments. We have apple cider and apple cider slush, made fresh from our own Anderson Orchard apples! 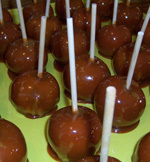 Our concession stand also serves caramel apples, caramel apple fondues, elephant ears, fried biscuits, with Anderson Orchard Apple Butter, fried apple pies and hot dogs. 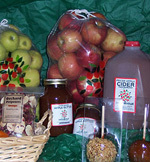 Each Fall, Anderson Orchard hosts an Apple Festival & Craft Fair. Join us for concessions, food and over 50 craft booths! Pick your own apples or buy them in our Apple Barn. Grilled sandwiches, hot dogs, sides, drinks, homemade breads, and homemade apple cobbler with ice cream are available. Visit our pumpkin patch and straw pile. Picnic areas and children's activities are also available.